The PE 2000 RF Plasma Etcher is specifically designed for reactive gas plasma etching and surface treatments. The unit is capable of 150 watts RF forward power at 13.56 MHz and up to four gas processing. 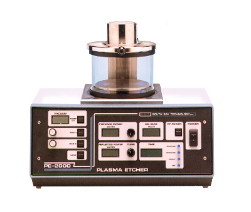 The system is ideal for R&D applications where single sample processing is needed and total control of each process parameter is necessary. Processes such as photoresist strip, BPSG removal, oxide and nitride layer etch, surface treatment of plastics and plasma cleaning are typical applications. Samples up to 6” diameter as well as irregular shaped substrates can be accommodated in the 200mm diameter vacuum chamber. A fully manual control system coupled with digital readouts and integral matching network with switching type power generator offer a wide range of experimental etch parameters. A stainless steel gas system with three-position feed provides maximum etch uniformity and the best possible utilization of the reactive species. Includes a separate vent to atmosphere line. Safety interlocks prevent mis-operation thereby protecting the user and the system. High etch rates at moderate power levels of 100 watts forward power can be achieved - greater than 200 Å/minute for oxide and 500Å/minute for nitride. System is supplied with two manual gas channels, but up to four mass flow channels can be added. For the full specifications download brochure.